Gold and silver have more or less confirmed they have bottomed and are ready for a multi-year rally. Their trend has not fully ‘reversed’ to the upside yet but the market breadth and internals for the precious metals sector are very bullish. My subscribers know that I am ‘bullish’ on precious metals and believe that they will be the best performing ‘asset class’ within the next three to five years for those who can only buy long (profit from rising prices). There are a few more big opportunities unfolding in other assets also but that is not what this article focuses on. There are more than enough signs which indicate that a looming ‘financial crisis’ is impending and will last longer than the Great Financial Crisis (2008-2009) did and will test the values of our society. During the ‘Great Depression’, although gold was not traded freely, the gold mining stocks made a ‘killing’ while the rest of the stocks were plummeting into a bottomless pit. 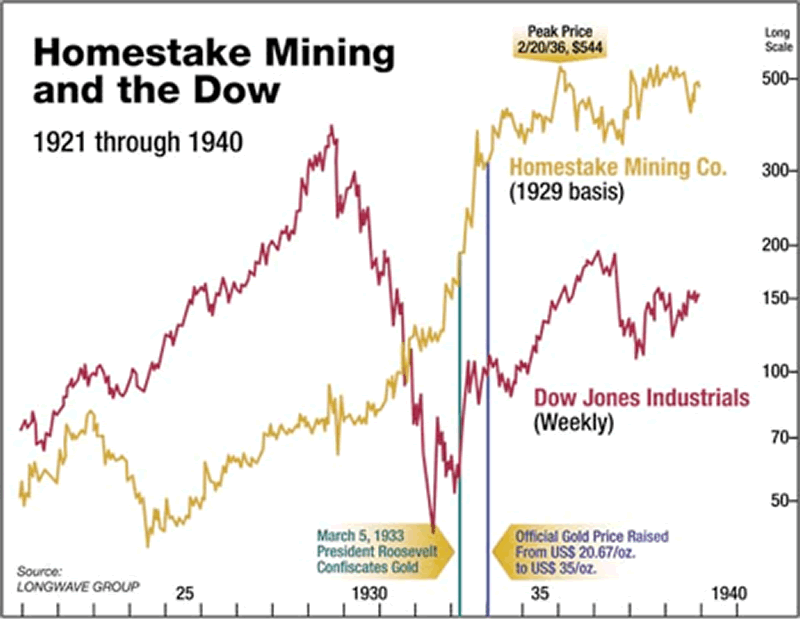 During the ‘Great Depression’, Homestake Mining, which was the largest US gold miner, at that time, outperformed the Dow Jones Index by a huge margin; the chart shown below clearly illustrates that while the other investors were monitoring their stocks which plummeted at close to zero valuations, the investors of the leading gold miner, Homestake Mining, incredulously multiplied their investment! During the period that the Dow Jones Index crashed, Homestake mining returned more than 1100% profits to its’ investors. Fast forward to the ‘Great Financial Crisis’ of 2007- 2008, when the stock markets and commodities plunged, however, gold and silver entered into a strong ‘bullish’ trend as seen in the chart below. The historical references indicate that during a financial crisis traders tend to flock towards gold which outperforms the markets by a huge margin! 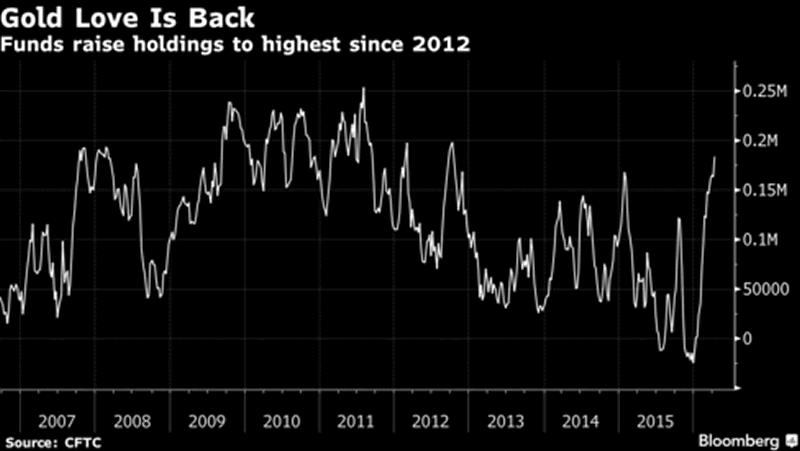 Gold has lost its’ luster, in the past five years, after topping out in 2011 when the FED and other Central Banks embarked on a money printing spree. 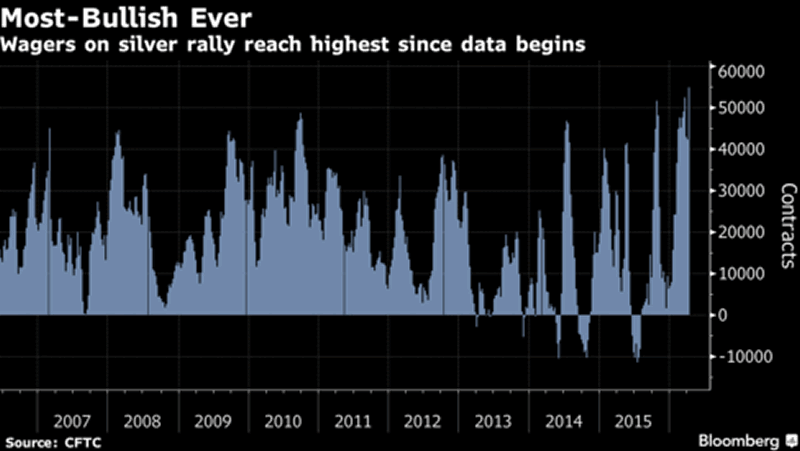 However, for the first time in six years, gold returned with a massive 17% rally in 2016. Despite announcements of further QE made by the ECB as well as negative interest rates which were announced by the BOJ, gold has ‘held its’ own’. This indicates that the traders are not buying the current upward move in the SPX, but rather, are accumulating gold at every dip. The ‘smart money’ enters the ‘asset class’ at an early stage of the new bullish trend, hence, it is important to follow the ‘smart money’ so as to verify if they too believe in my hypothesis that we are about to witness a ‘massive financial crisis’ unfold! The ‘smart money’ continue to invest in gold. They have increased their holdings to 184,218 contracts (according to the latest Commodity Futures Trading Commission data) which represents double their holdings of two months earlier. This is also the highest holdings since 2012. Is the ‘smart money’ favoring only gold? No, they are also loading up on silver. Professionals have increased their net-long positions by 54,885 contracts which is a 30% increase; the highest percent reached since 2006, according to CFTC data. The data (in the chart below) clearly points to the investment preferences of the Money Managers. They are utilizing the current dips in order to add to their positions in gold and silver. I have talked about how gold and silver will be the ‘asset class’ to invest in, for the future for many years, but we have been waiting for them to bottom first before getting positioned. The current accumulation in both suggests that gold and silver have put in their long-term bottoms. This will be an uptrend for several years if my analysis is correct. Due to monetary policies, enacted by the FED and the other central banks, I expect that the SPX is now completing its’ ‘topping formation’. The retail traders and others may dump their gold and silver because they believe that the stock market is starting a new ‘bullish’ trend. I expect that there will be an exceptional opportunity to buy soon in metals. I want to maximize the gains of each and every dollar that is invested, therefore, I will advise my subscribers when it is the most optimum entry point. Continue to follow my analysis and trades so you will know when the optimum time to enter into gold and silver is and then watch your investments grow exponentially.